On Thanksgiving Day 2001, my college roommate and I were on vacation in New York. We had just seen the parade and noticed kids dressed in letter jackets with clipboards at the Ed Sullivan Theatre. Being nosey as I am, we checked them out and ended up going to the Thanksgiving Day taping of David Letterman's Show. David Sedaris was the guest and he read from his book "Holidays on Ice." I've never been the same since. Both Davids did me in. Now, I'm banned from reading David Sedaris in public because I cannot keep from laughing louder than is publicly acceptable. So I can never resist an opportunity of hearing David Sedaris read aloud. It's the delivery as much as it is the words, for me. 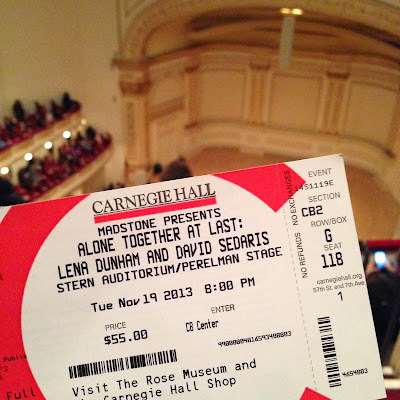 This evening was billed as "Alone Together at Last: Lena Dunham and David Sedaris." Lena writes and stars in the HBO show "Girls." She also writes essays and has a book on the way. They were introduced by Zadie Smith. Lena and David took turns reading from their various essays and stories. I laughed louder than is publicly acceptable. Go read David's books. You won't regret it. He's also on a reading tour right now - check your local listings. I had planned to go with my friend Tracee, who would have laughed louder than is publicly acceptable right along with me. She broke her foot and climbing to the heavens of Carnegie Hall just wasn't possible. Fortunately, my friend Alicia was waiting in the wings and bonus - it was her first time in the hall. I do love being with a person on their first time in a New York sanctuary.